What an amazing day it was helping Susie and Trent tie the knot in an intimate wedding on a mountain top at Mt Coot-tha, in the company of their immediate family. That backdrop is simply amazing, as was the couples connection as they became husband and wife. 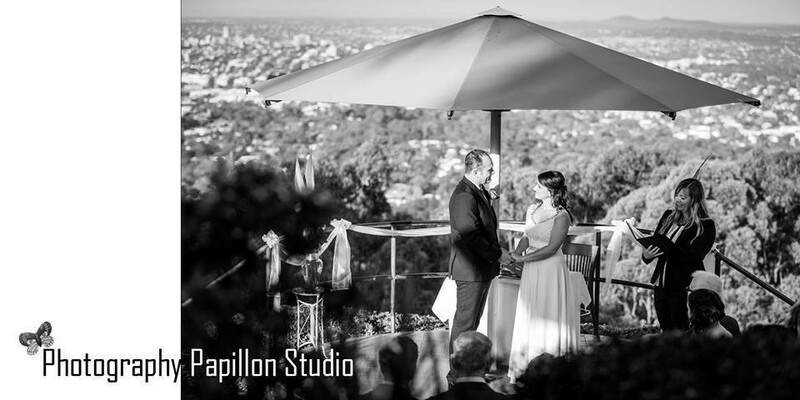 Big thanks to the girls at Papillon Studio for capturing this special moment. Following the intimate ceremony, the happy bride and groom headed to the Mt Coot-tha Botanical Gardens at the base of Mt Coot-tha for their wedding photo shoot with their photographers, before joining their close group of guests at Summit Mt Coot-tha’s outdoor pavilion for a coverred outdoor style reception with delicious food and stunning views. Thank you to Susie and Trent for kindly sending this beautiful photo of your Mt Coot-tha wedding to me. I am so happy to hear you enjoyed your relaxed and intimate wedding so much!